What special software is needed? What do I need specifically to get started? Can I customize the report? Can I control the order of the photos? Are my original photos modified? Can anyone access the report? Can I collect more than just photos? How do I check if my photos are geotagged? This web page is designed as a resource for Gannett Fleming employees who wish to quickly review, collaborate and share their field photography and notes with their project team, clients, or other project stakeholders. Through the use of geotagged photographs and field collected notes users of this workflow will benefit from a number of custom derived products that can be produced in a matter of minutes. This web site includes instructional videos and links to sample products illustrating some of the automated mapping and reporting capabilities developed by the Earth Science & Hydraulic’s GIS Team. It also provides an overview of the workflow and answers some frequently asked questions (FAQs). 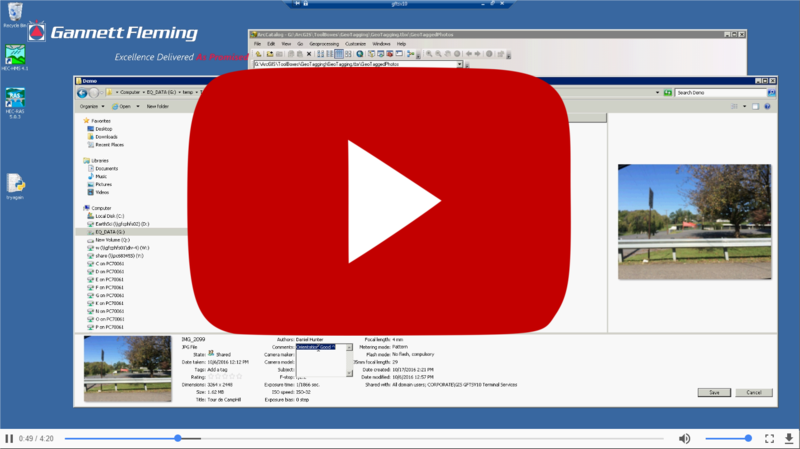 The 4-minute video below provides an overview of the photo logging workflow after you return to the office and download your geotagged photos. An interactive map similar to that shown below is found in each photo log report. The workflow is designed to automatically label and map each photo showing the direction the carema is pointing. Depending on the extent of your photos, the map background will consist of either a high-resolution aerial image or topographic map for smaller scales. However, with minimal effort, the map can include a custom background map such as scanned pdfs, and other overlay layers from GIS or CAD. Users can navigate the map and click on points to review additional information for each photo. The sample map above found in each report provides a interactive map showing each photos location and direction. Users can navigate the map by panning with the left mouse button, zoom-in by holding down the shift-key and drawing a box, or click on a photo location to review more information in a popup. The full size photo can also be viewed by clicking on the thumbnail shown in the popup. The online map is completely customizable. You can change the base map, or add any additional GIS or CAD overlays. Each online html report also includes a link to your typical slide show and photo grid (as shown below), which allows users to quickly review all the photos and comments collectively. No, just a camera (smartphone, tablet, or digital camera with GPS) and a Windows computer. 1 - A mobile device capable of collecting geotagged photos – with location services enabled. This includes but is not limited to any of the latest mobile phones or tablets. To ensure your device has location services enabled, utilize one of the following links to setup your Android or iOS device. 2 - (Optional) A mobile App for editing EXIF Photo Information. We’ve researched numerous 3rd party iOS apps and found that the Photo Name Pro app provides a quick and simple solution to add photo comments in the field. This app is already installed on our ready-to-use iPad or you can purchase it from the App Store for $8.99. The app will even embed your comments in to the image, or add a logo to your photos. We have not tested field note editing on Android devices to support this workflow. If you find a good Android please let us know, so we can add it here. 3 - A desktop computer running Windows to review or edit Photo Information after they are downloaded to the Gannett Fleming network. – Refer to the instructional video above. 1 - Take photos, add your comments, and download them to a folder on the GF network. 3 - Send an email to ES&H GIS Team and provide a short Project Identifier that will be used for the title of the Photo Report. Also, include... a link to the network folder containing the photos; a html link to the online logo you want to use in the report header; and finally let us know if you want individual map insets alongside each photo. 4 - Wait for the GIS team to reply to your email with a hyperlink to the new online Photo Report. 5 - Finally review, perhaps edit comments or remove photos, and resubmit or print and share your photo log report with others. A project with 20 photos can be generated in less than a minute. The length of time to develop the online photo report depends on the amount of photos taken, but regardless of the amount of photos, the time spent is primarily computer processing time, not man hours. The products resulting from this workflow come in a variety of forms. The most readily available and easy to use is the online HTML Report. Anyone with an internet connection and web browser can access this online report. The HTML Report is designed to be print-ready including a cover page with a map followed by an index of all the photos on the second page, and finally the remaining pages showing two photos per page. Printing of the report has been tested in the latest versions of Chrome, Firefox, and Internet Explorer web browsers. The HTML report can also be converted to a PDF document or Microsoft Word for further formatting and editing. A comma separated value (csv) file listing latitude, longitude, azimuth, date and time, name, description and photographer can also be downloaded. Additional interactive online web apps can also be produced to share with clients internally and externally. With a few clicks of the mouse, we can automatically generate an interactive Story Map Tour similar to the one shown above. Users can navigate the web app by clicking on photos at the bottom or selecting their location on the map. This web url can easily be shared internally or with our clients by copying and pasting it in an email. Can I customize the look and feel of the report? Yes, in addition to the html print-ready formatted report, we can provide a Microsoft Word document that can be edited to your liking. Can I control the order of the photos shown in the report? Yes, the photos are ordered in the report based on the alphabetical ordering of the jpg filenames. After downloading the photos, you can choose to rename the files to control the order shown in the report. How accurate are my photo locations shown on the report map? It varies and will depend on the GPS used to collect the photo and how it is implemented in the field. Generally, a smartphone or tablet will produce horizontal accuracies of +/- 50 feet. A consumer grade GPS such as a Garmin with WAAS correction will be +/- 6 to 15 feet, and a bluetooth GPS receiver such as the Trimble R1 will be less than 3 feet. If you are looking for sub-foot level accuracy contact us for more details. The ES&H GIS Team can provide a GPS receiver that will connect to any iOS or Android mobile device resulting in 3-ft or better horizontal accuracy. No, the original photos located in the network folder are not modified in any way. 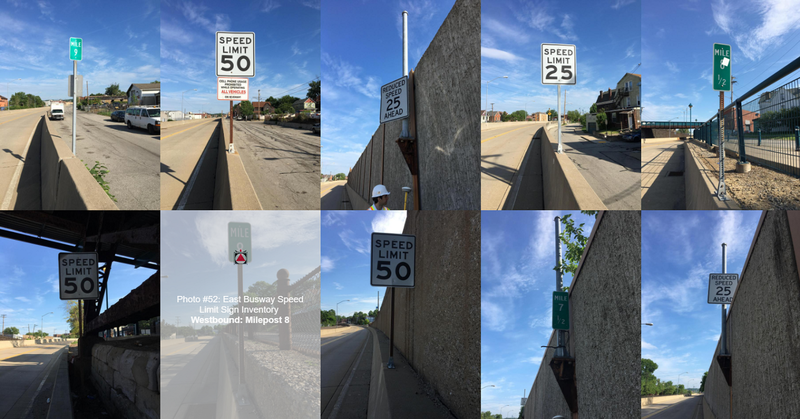 If these photos are moved, the online report will still be available. Can anyone access the online photo report? Yes, anyone with an internet connection can view the photo log report on a desktop computer at work or from home or on a mobile device. Can I collect additional information besides photos and comments? The short answer is yes, however this generic workflow is designed to work with geotagged photos including user-defined comments. For collecting additional information, we have designed project-specific online and mobile forms where users can conduct field work using smartphones and tablets while automatically populate quality-controlled online databases in the cloud. For more information, on this type of inspection workflow contact us using the Contact Form on the left side the page above. Is it possible to provide a secure online photo report with username and password access? Yes, contact Chris Krebs for additional details. 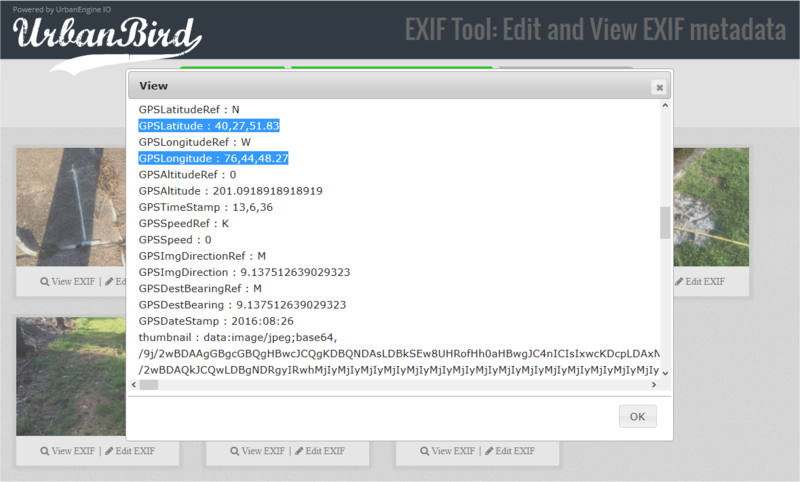 You can upload one or multiple photos to this web site and review the EXIF metadata embedded in the *.jpg file. If it contains Latitude and Longitude coordinates as shown by the highlighted records in the image below, it is geotagged. If the 'GPSLatitude' Tag is not listed, the photo is not geotagged. You can also use this website, to add geotagged coordinates to your existing photos by placing a marker on a map. Check out the Edit EXIF Tool provided. The Urbanbird website can be used to review EXIF metadata or add Latitude and Longitude coordinates to existing jpg files.